LAS VEGAS (Jan. 23, 2018) – Mack Trucks donated a 2018 Mack® Granite® Axle Back model to support the Concrete Industry Management (CIM) Auction. All proceeds from the auction, which will be Wednesday, Jan. 24 during World of Concrete 2018, will benefit CIM and their mission to develop broadly educated, articulate graduates grounded in basic construction management with specific knowledge of the concrete industry. The Granite model will be offered for bid during the live auction portion of the event beginning at 1 p.m. It features a 10.5 cubic-yard M77 concrete transit mixer donated by McNeilus. CIM’s four-year degree program is designed to provide students with the in-depth business, technical and communication skills needed to be successful in today’s concrete industry. The program is currently offered at four institutions – Middle Tennessee State University, the New Jersey Institute of Technology, California State University – Chico and Texas State University – and has approximately 500 students. The donated Mack Granite model is powered by a Mack MP®7 engine with 375 horsepower and 1,360 lb.-ft. of torque. The truck is equipped with a 14-speed Mack mDRIVE HD with ultra-low ratio creeper gears, as well as Mack front and rear axles. Mack GuardDog® Connect is standard and provides a proactive telematics solution that helps maximize uptime by proactively monitoring diagnostic codes that could shut a truck down. 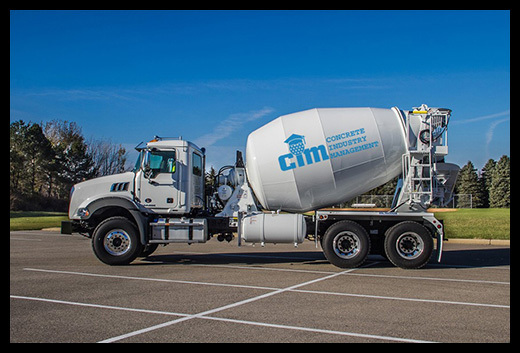 Last year, members of the concrete industry generously donated dozens of items to CIM’s silent and live auctions, raising more than $875,000 for CIM programs. Mack has participated in the CIM Auction with a truck donation for several years, most recently in 2017.